Fushiki-juku is an executive development program exclusively designed for global business leaders in Japan. It runs under a non-profit academic organization called Fushiki-an established in Tokyo in 2010. The participants are high-level business executives identified by the senior management of their corporations for entry to this program. The majority of participants is in their forties and belongs to leading Japanese corporations (see below for participating companies). Fushiki-juku’s 10-month program (May to February every year) is quite unique and contrasts sharply with ordinary MBA-type executive programs. Unlike many business schools, Fushiki-juku puts stress on humanities and liberal arts and also on learning histories and cultures of different countries in comparative perspective. The reason for the focus is our belief that today’s business leaders who work in a globalized business environment need to understand and know more about different cultures and value systems around the world. In particular, Fushiki-juku’s program is aimed at encouraging students to understand in a reflexive way differences and similarities among various traditions, so that they can re-examine critically their own place and identity in a comparative context. This is why Fushiki-juku starts its program with courses on religion, philosophy, culture, history and so on. Emperor: Who are you who are standing before me? Bodhidharma: I know not (fushiki). By that disappointingly simple answer, Bodhidharma implied that our knowledge is inherently incomplete and superficial so that we cannot come to a comprehensive understanding of the world unless each of us humbly accept the fact that “I know not”. As you may notice, his point is similar to the Socratic paradox known by the phrase “I know that I know nothing” or “I know one thing: that I know nothing”, a well-known saying derived from Plato’s account of the Greek philosopher Socrates. Our program is, therefore, designed, not only to add a new stock of knowledge, but also to transform cognitive schemes that we unconsciously depend on in our daily life. To put it differently, it aims to upgrade the Operating System (OS) of the human mind itself instead of just feeding a new set of data. Throughout the program, students are encouraged to know more about themselves and acquire a capacity to make better judgment on complex issues that require examination from multiple points of view. Fushiki-juku classes are held regularly on Saturdays (from 10a.m. to 5p.m.) so that students can attend classes while continuing their jobs as executives in their own companies on weekdays. During the academic year, students have to take part in two periods of fieldwork at home and abroad, in July and October. They meet and have discussions with important figures in the places they visit. Its academic year is divided into four Modules. The first Module is allocated for studying the history of major cultures, civilizations and religions around the world. In the second Module, the focus is shifted to the studies about Japan. Students are asked to know more deeply about their own country including its cultural traditions and value systems. They also learn about the factors behind the success and failure of Japan’s economy. The last Module is the hardest and, perhaps, the most rewarding for students. At the end of the academic year, each of them is required to present their findings to his or her own company’s top management and to create an action plan for the future. Some of the proposals have actually been adopted by management and even changed the company’s growth path. Dr. Iwao Nakatani (Ph.D. in Economics, Harvard University in 1973) is the founder and Chairman of Fushiki-an and Head of Fushiki-juku. He is also Chairman of the Board of Counselors of Mitsubishi UFJ Research and Consulting Co., Ltd, one of the leading think tanks in Japan, and is Emeritus Professor of Hitotsubashi University. Dr. Nakatani is known as one of the leading economists and opinion leaders in Japan. He has made various contributions to the intellectual community as well as Japan’s policy making process over the past three decades. Among his many roles as public policy adviser, he served on Prime Minister Hosokawa’s Structural Reform Council in 1993, and himself played the role as deputy chairman of late Prime Minister Obuchi’s Economic Strategy Council in 1998. Dr. Nakatani has taught economics for many years in various well-known universities such as Harvard University, Osaka University, and Hitotsubashi University. In 2000, he was appointed President of Tama University for eight years. He also served as an outside director of Sony for six years between 1999 and 2005. For the period 2003 to 2005, he was Chairman of the Board of Directors at Sony. 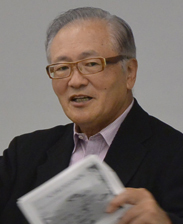 Dr. Nakatani is the author of a large number of best selling books and articles, including Introduction to Macroeconomics, one of the best-selling macroeconomics textbooks in Japan, Why is Capitalism Self-collapsing?, and The World After Capitalism. In 1988, he won the Ishibashi Tanzan Prize for his influential paper, “Japan’s Choice as a Responsible Nation,” published in the ASTEION.